So about that green sweater… I put it in time out while I stewed about what to do. (And okay, I admit it, there was a bit of sulking, too.) And then I did what I should have done all along: I consulted Ravelry. Guess what I learned? The length of raglan sweater is the same as the depth of your armhole. (Just typing that makes me go, “Well, duh!” As usual, it’s the easy stuff that trips me up. Sigh.) I was using Elizabeth Zimmerman’s EPS system to design the green sweater, and her calculations say that the yoke length should be about 25% of the chest circumference. That’s probably true for men’s sweaters and for ski sweaters which need more room in the shoulders and upper arms, and it was probably true with the oversized fit popular in the 1980’s, but for today’s fitted ladies’ sweaters, the yoke depth is closer to 20% of the bust measurement. So my green sweater, which had a 36″ bust measurement, only needs about a 7.5″ long yoke, rather than the 9″ long yoke that I’d knit. 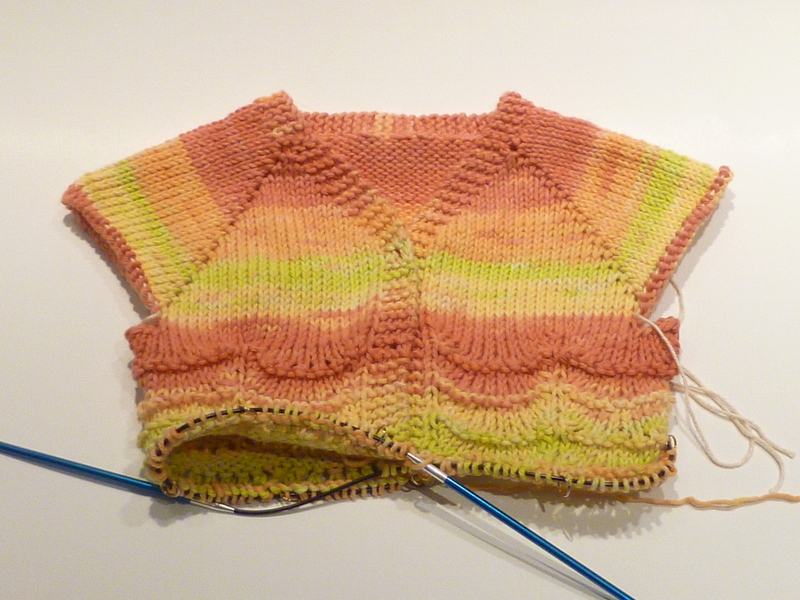 I’d held up on working on the Scalloped Lace Baby Cardigan, because that is also a raglan, and I was worried that it wasn’t going to fit if my raglan math was off. So I looked up the armhole depth for a 12-month old in the Craft Yarn Council’s Standard Body Measurements, plugged that into my spreadsheet, and I was off to the races. I’ve been absent lately, not because I haven’t been knitting, but because I’ve become totally consumed with a community project. The City Council where I live seems to think that it’d be a good idea to bulldoze our only downtown playground (which is also used by the local elementary school) and build a parking garage. I love this playground. I’ve been taking my kids here for almost ten years. The neighboring elementary school is one of the oldest in the nation and is about to get a $27 million renovation. It’s going to be a first-class facility that will draw families to our downtown area. Tearing down the school’s playground and hiding the school behind a towering parking garage is hardly the way to show that education is important to our community. So first I got upset. Then I got mad. Then I went to work, mobilizing all the moms I know in this area. And getting them to mobilize all the moms they know, and so on. There’s a lot of money on the line, which always makes for a contentious debate, but angry moms are ferocious. And we’re not giving up or going away. I have been knitting, though, in between council meetings and planning sessions. I went to a baby shower yesterday, and I knit the expectant mom an adorable little hat that looks like an upside flower plunked down on a baby’s head. I used some seriously scrumptious yarn (Sublime cashmere merino silk aran) in a gorgeous pinky-mauve color. It turned out great, but you’ll have to take my word for it, since I completely failed to take a picture before I gave it to her. Sigh. The red FLS is definitely on its way to the frog pond. I’m thinking I need a niddy-noddy, though, so I can frog, skein, and soak the yarn so I can use it again for another project. Skeining yarn by hand is a royal pain. The baby sweater is coming along nicely (it’s been a great project to tote around with me); more on that just as soon as I dig out my camera. So what’s on your needles? Our house has the plague again. Yes, we have apparently angered the gods this year. I’ve managed to avoid it so far, but I’m not holding my breath. The little people in the house are dropping like flies. I am totally bummed, because it’s spring break this week & the weather has been gorgeous here. I’d envisioned lots of picnics and walks and bike rides. But I suppose the silver lining is that endless hours of G-rated television and DVDs equals plenty of knitting time for me. The Twisted Lace Cardigan (impossible-to-photograph dark green). 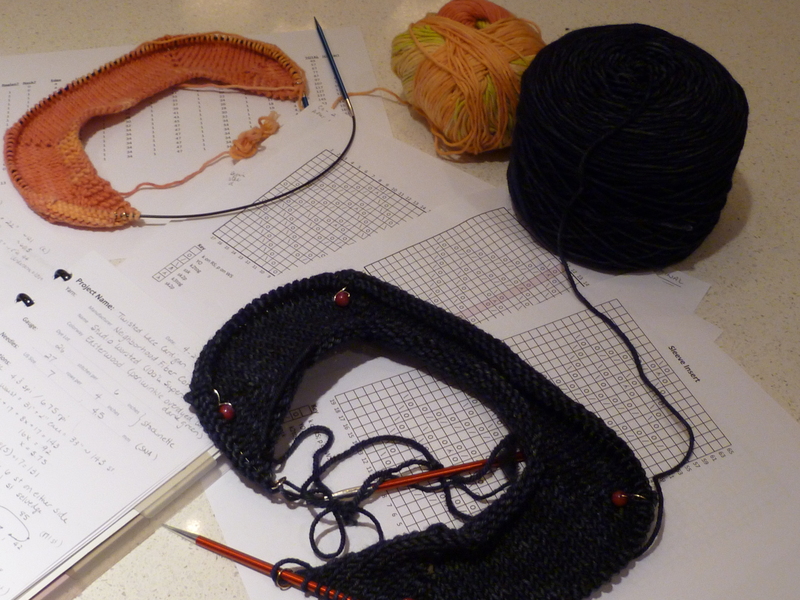 I knit up a huge gauge swatch, testing out both plain stockinette gauge and several lace patterns that I had charted out. As expected, the gauge for the superwash yarn relaxed a lot after a Eucalan bath, so I tweaked the lace pattern a bit to accomodate the larger gauge, then worked out stitch counts and shaping calculations for the rest of the sweater. This yoke is larger than the baby sweater, so it’s much slower going! Ideally, I’d like to get this one done by MDSW, which is the first weekend in May, but since that’s only about 30 days from now… well, we’ll see. The good news is that the weather has been lovely this week, so I should be able to take some better pictures of my Haruni shawl to share with you. Stay tuned! Tuesday is Tools Day: I ♥ Charts! I’ve already talked about how I use my yarn scale and a spreadsheet to maximize my yarn usage or check to make sure I’ll have enough yarn to finish a project. I use a spreadsheet for most of my knitting calculations (figuring out stitch counts, increases, decreases, etc.). 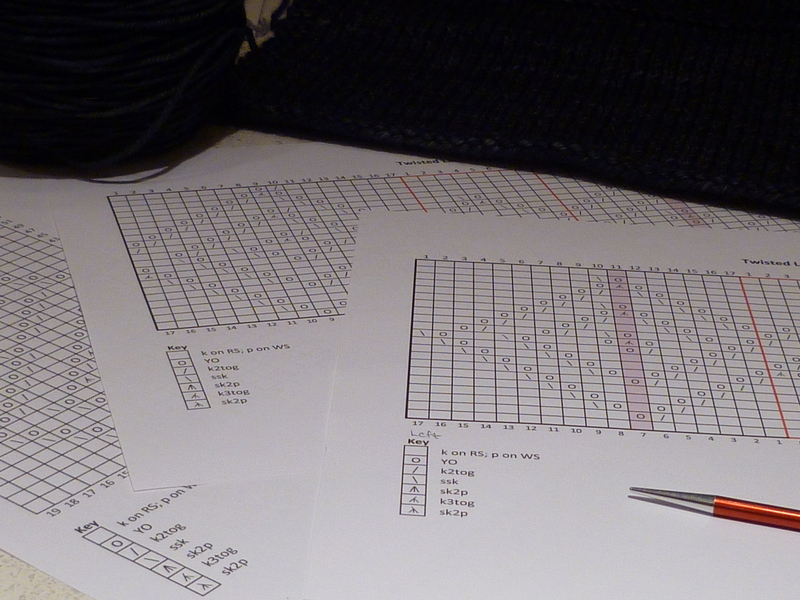 I also find spreadsheets really, really handy for making knitting charts. Charts are one of those things that knitters either love or despise. Everyone’s brain works differently, so I suppose it depends on how your particular wiring is connected. We already know that my wiring is seriously geeky, so it should come as no surprise that I adore charts with the fiery passion of a thousand suns. I love the fact that they take up less space than pages of written directions. I love that I can see how the different rows in my pattern correspond to each other. I love that I knit faster and with fewer errors if I know that the YO in row 11 should be directly above the k2tog in row 9. I vastly prefer patterns with charts. I won’t even go near lace without a chart, so if a pattern doesn’t have a chart and I absolutely, positively must knit that pattern, I’ll create my own chart to use for that project. One of the things that I love about charts is that they make it easier to substitute your own stitches if you desire. I was looking at a sitch pattern the other day that called for “slip 1, knit 1, psso.” This makes a left-leaning decrease. If I’d rather work that decrease as ssk, I can just substitute ssk for that symbol. With the written directions, I’d have to stop and translate it each time. Similarly, if you wanted to place a bead on a shawl instead of working a nupp or a bobble, you could just change what that symbol means to you and use the chart as written. You can create basic charts in any spreadsheet program—or even just plain old graph paper— by making your rows and columns into small squares. (If you want to get really fancy—and this can be helpful for color work—you can adjust the size of your rows and columns to correspond to your row and stitch gauge.) You can use simple characters (/ for k2tog, \ for ssk, O for a yo, – for a purl stitch, | or a blank square for a knit stitch, etc.) or you can get fancy and use a knitting font. There are a couple out there, but I use this one by Aire River Design. It’s got most of the symbols that I need and use frequently, and best of all, it’s free. I had a lace idea in mind for the green sweater, so I trolled around in my stitch libraries, looking for something that I could adapt to meet the design in my head. I found one in Vogue Knitting Stitchionary 5: Lace Knitting that gave me a good start. (I have several stitch libraries that I use frequently; the VK books include charts for all their stitch patterns, which makes them some of my most-used stitch references.) I made some changes to the shape and the size, added a section on the left, then mirrored it on the right. Then I decided to turn the pattern on its side and resize it to use on the sleeve. I stayed up far too late last night, but when I was done, I had several charts ready to go for my cardigan. Tell me, do you like charts? Or do you prefer written out instructions? The first is a baby sweater, which will be a quick knit, so it almost doesn’t count. Right? For this cardigan I’m using the pretty Ty-Dy Cotton I mentioned last week. I did a bit of swatching and worked out a lace pattern that I think will look lovely at the bottom of the sweater. I love top-down seamless sweaters for babies, because they’re quick to knit and they’re fun and easy to experiment with, since you can see right away if your pattern is going to work or not. And seamless knitting projects mean that when the knitting is done, all I have to is weave in my ends, sew on the buttons, and it’s ready to gift. The second is a sweater for me. I should finish something that’s already on the needles, or work on the purple one I started designing for the class I took with Shirley Paden. But the yarn I bought at HYP, a dark green worsted-weight superwash from Neighborhood Fiber Company, kept calling to me. I was envisioning something with some lace (to stretch my limited yarn a little bit further), a deep v-neck, and 3/4 sleeves. I pulled out some stitch libraries and poked around until I found a stitch pattern that I liked. And then (of course), I had to modify it a bit (more on that later). Of course, if I do get the green sweater done, it will guarantee that the weather for MDSW will be sunny and 90°F in the shade!